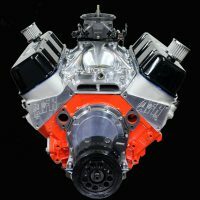 Traditional small block Chevy fans just received some love from Chevrolet Performance in the form of an all-new small block Chevy crate motor, the ZZ5 350. 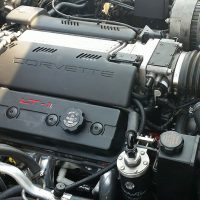 Building on the solid foundation of the original 350 HP and 385 HP Z4 engines, Chevrolet engineers groomed more power out of the package with further cylinder head upgrades that include a new version of the Fast Burn head equipped with the new blue LS3 beehive valve springs for higher rpm potential. 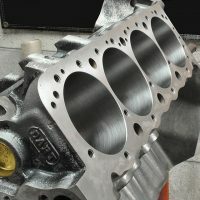 The newly revised cylinder head design with beehive valvetrain has also been incorporated into an updated version of the ZZ383 “stroker” crate engine, raising power from 425 to 450 horsepower. 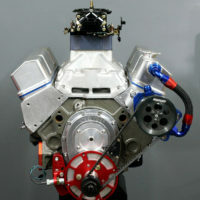 And it has also been specced as a new revision for the CT400 circle track sealed racing engine. These upgrades make the new ZZ5 more powerful than any 350 engine every installed in a Chevrolet production car. 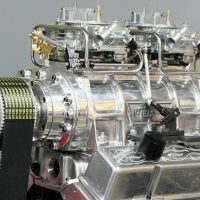 According to Chevrolet representatives, "All of the engines with the new Fast Burn head/valvetrain design complement their enhanced high-rpm performance with the low-rpm torque for which the classic small-block is renowned – at least 300 lb.-ft. by only 1,500 rpm. 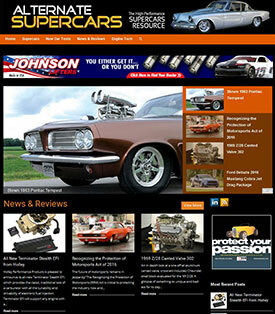 On the street or track, it translates into an immediate feeling of power that’s sustained across the rpm band." The ZZ5 350 is being offered in an economical base form (part number 19301293), including an intake manifold, distributor, water pump, damper and flexplate, as well as an upscale Turn Key package (part number 19301294), which adds a four-barrel Holley carburetor, starter motor, fuel pump, air conditioning pump, alternator and front-end accessory drive. The upgraded ZZ383 (part number 19301295) includes a cast iron water pump and balancer, but the ignition system and other accessories must be purchased separately. 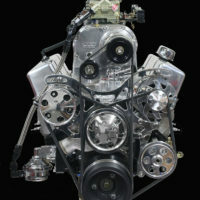 The CT400 factory-sealed engine (part number 19318604) includes a racing-only eight-quart circle track oil pan featuring a dual kick-out design, along with a valve cover breather kit and a special “kool nut’ rocker arm design. 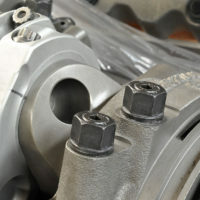 The beehive valve spring design provides improved high-rpm capability and valvetrain stability. The shape, which is smaller in diameter at the top and expands in an egg-shaped barrel at the middle, reduces overall spring weight, allowing a smaller, lighter retainer that translates into less reciprocating mass in motion. 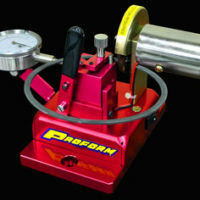 The design places the maximum area of the spring’s coil at the position of greatest stress under load for improved stability at higher engine speeds. 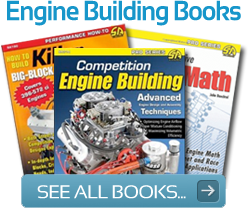 This permits less spring pressure and offers greater heat dissipation characteristics – all of which improve valvetrain life and high-rpm capability. 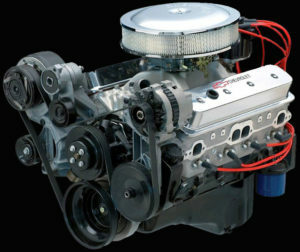 Chevrolet Performance also offers new assembled heads and bare heads, and a beehive spring conversion kit (part number 19300952) for those who wish to retrofit earlier Fast Burn heads.